Every so often we get an invite to an opening event that really grabs our attention. 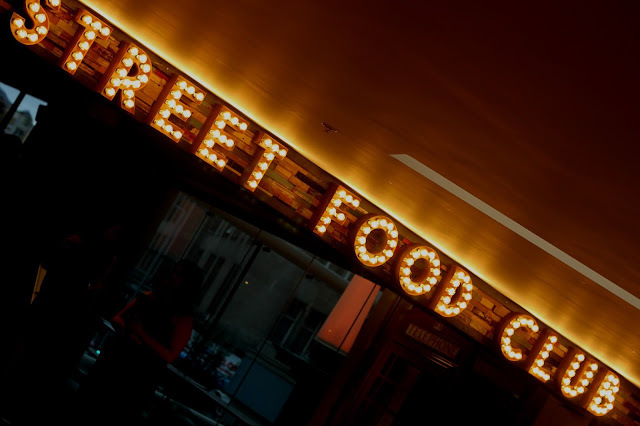 We love something that little bit different so the idea of the Nottingham Street Food Club really needed a visit and review. Especially when the invite promised drinks and samples. The Nottingham Street Food Club is situated upstairs in the Intu Victoria Centre in the Clocktower Dining area off Mansfield Road. It's premise is simple- to bring street food flavours within an enclosed food court environment. We love the idea although from this evenings opening night we're a little unsure a number of things will work for the new venture. With it's location within the Victoria Centre away from the main footfall of people we feel the Nottingham Street Food Club hasn't chosen wisely. Whilst the clocktower dining area sounds a good idea we've already seen Joe's go within a short time of opening and I'd happily put a good bet that a number of other retailers are struggling to maintain the numbers needed to justify their presence. The Original Burger Co downstairs had no one sat eating when we walked past at 7pm last Wednesday night and we've seen similar trends elsewhere. Looking at things a little deeper maybe street food should be on the streets and not forced into an unnatural shopping centre environment. Walking in to The Nottingham Street Food Club just feels like you're walking into a fancy bar that turns into a bit of a grotty market where they kind of ran out of ideas. With three of the food stalls following a rough looking industrial theme and another shaped like an old caravan. A little bit of continuity would have looked much better. The units themselves looked run down. Had we been explained the look that they were going for we may have understood why but as it stand they just looked odd and fashioned together in a hurry. As a VIP party we'd have liked to have seen some hosts mingling to explain the ideas behind the concept as for us the styling really didn't work. Pizza- Whilst it's not rocket science to make a pizza it looked like the pizza stall was the odd one out at the party set in a caravan. There was nothing to advertise pricing or even what they did other than a big stack of small pizza boxes to the side of the counter. There wasn't even a sign to show the name of the business leading us to think that someone had dropped out and been replaced in a hurry. Unlike any of the other stalls they were sampling and the pizza's were genuinely nice. I didn't see them sell a pizza but plenty were coming out for sampling although as we've always said, once you've been to Italy and eaten a seriously good pizza on a beach for a few euros you're going to get very particular and whilst they were nice I wouldn't go to a street food stall for a pizza when there are so many other places across Nottingham I can get a good pizza (Including the amazing Inferno across the road). Chef Jugz- Offering Fusion Taco's in either Gai Yang Chicken or Jerk Veggie varieties their menu was lacking in variety. The taco's certainly weren't to my palate but we'd have liked to have seen much more choice. Worryingly there was also no smell of the food as you walked past and disappointingly they weren't sampling despite no sign of a queue. Numinums- Offering Vegan Cuisine, our first look at the menu lead us to think they'd stuck to a very usual and safe Vegan menu. Nothing particularly different or sadly special and at £6 a time for a snack size plate they weren't really representing good value for money. Also with just two menu options or some toasted flatbread it was definitely not inspiring us at all. The last food stall was Homeboys. Apparently the man behind them was a Master Chef Finalist and a Japanese Soul Food Specialist so we were hoping for big things after the uninspiring other stalls. They were offering some very interesting Bao Buns for £6.50 featuring a steamed Bao Bun with Belly Pork filling although we opted for the Rice Cake at £3.50. Having eaten rice cake at some of the Asian inspired restaurants across the city we were intrigued but what they would come up with an sadly the result was a real let down. It was simply rice cake covered in a thick terriyaki style sauce which lacked flavour, presentation or any quality. If that's the standard of food served up by a Masterchef Finalist I'll personally offer to drive Greg Wallace up to Nottingham to dish out some advice and we didn't even get something resembling a fork to eat it with. The final Stall was the Bar. Offering a selection of simple drinks as well as beers although we were lucky to be given a bottle of Freedom Pils to try so didn't really need the bar on this visit especially on a school night. Street Food is usually one of convenience however they seem to be taking the convenience out of street food by making attending a ticket only affair. Whilst in some ways it's a good way to gauge interest it also means they will lose out on the people that want street food type dishes- the working lunches, the snackers and those of us that might be on an unplanned visit to town. If you do want to make a reservation there's no website up and running but you can follow a link through their facebook page. We left the Nottingham Street Food Club a little annoyed and very hungry. We were invited to what should have been a showcase event. We've been to VIP openings before where poeple have been on site to meet and greet. We never were or saw anyone approached by a representative to talk us through the concept. No one was out and about sampling despite what our invite advised except for the unnamed pizza stall and for a preview event it was a real let down for us and we subsequently headed off into town to find somewhere to eat.